Top 11 of '11 (iOS). 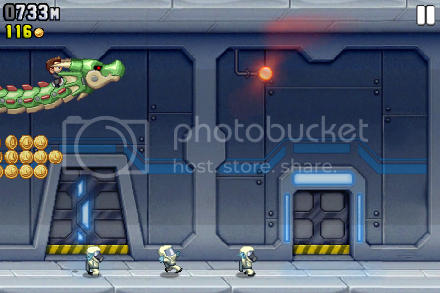 Number 3 - Jetpack Joyride. by PaulEMoz in "Barry Steakfries", "Canabalt", "Halfbrick Studios", "Jetpack Joyride", "Solipskier", "copter"
Every so often, a game comes along that, for whatever reason, becomes a juggernaut. We've seen it in the past... Angry Birds, World of Warcraft, Horace Goes Skiing. 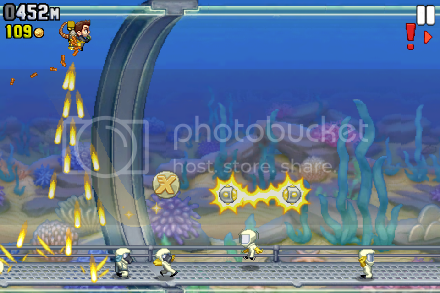 This year saw a juggernaut arrive with a jetpack strapped to its back... Jetpack Joyride. 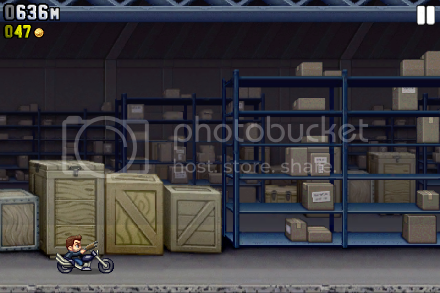 Jetpack Joyride is touted by many as being another entry into the "running man" genre of games... you know the ones, like Canabalt and Solipskier, where you have to head from left to right as far as possible, before some obstacle or other brings everything to a crashing halt. It's a very popular game style on the iPhone, probably because such games are very easy to play. However, it's actually more like those old Flash "copter" games that were all the rage years ago. Oh yeah, baby... now we're rollin'! Any game is only as good as its hero. 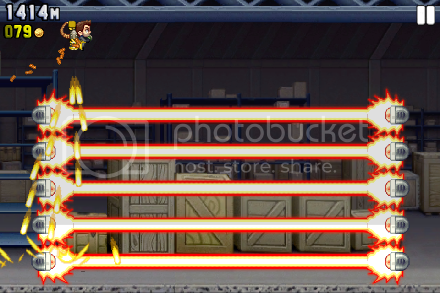 Luckily, Jetpack Joyride has one of the best heroes in modern gaming... a man going by the extraordinary name of Barry Steakfries. The name may be ringing a bell with you at this point... that's probably because he's been seen before. In fact, he's a recurring character in developer Halfbrick Studio's games. And why wouldn't he be? You can't go throwing away a character like Barry Steakfries! Ooh, they look hot. Better keep away. What of the game, though? What makes it any better, different, any more worth playing, than the games I've already mentioned? Well, obviously the jetpack gives it a different mechanic, for starters. Running and jumping has a certain feel to it. Flying a jetpack is completely different, and takes some adjustment (unless you're still hooked on copter games, that is). Fortunately, flying a jetpack is also great fun, especially when it fires bullets at the ground. This might not be as much fun for the scientists that are running about, but they're all expendable commodities in the quest to, ummm, get as far as you can whilst wearing a jetpack. Have you met my friend? He's called Mr. Cuddles. This quest has its rewards, though, in the form of... goooooold. Shiny gold coins, in fact, which are suspended in mid-air, ripe for collection. These come in handy because, when you're inevitably brought sliding on your chin to a bitter end, you'll be dumped back to the start, and to the in-game shop. That's where you can go a-spendin' all your lovely coins. This is where a large part of the game's appeal lies. You can buy all sorts of stuff in the shop, from new outfits to improved jetpacks to vehicle upgrades to missions. Hang on a minute... vehicle upgrades? Rat-a-tat, rat-a-tat. Haha, see those scientists run! Oh yes, I almost forgot... at points throughout the game you can pick up a vehicle to help speed you on your way. These include the Bad As(?) Hog, a Harley-type motorbike that's cool as hell, to a crazy freakin' teleporter that's, well, a bit rubbish really, to Mr. Cuddles, a giant robot dragon. These things are great, but in reality they only offer you a limited amount of protection. You see, this being a top secret lab, they have deterrents against thieves, and those deterrents come in the form of lasers. Giant, powerful lasers that, much like the lovely gold coins, are suspended throughout the complex. One hit is enough to see you brought to a halt, which is why it's important to pick up a vehicle and stay with it. Because if you hit a laser, it's the vehicle that gets destroyed, and not you. Quite important, that. Barry Steakfries, lying dead, coz he landed on his head. When you do eventually come to an unfortunate demise, it's not necessarily game over. If you've picked up a Spin Token, a floating 'X' that you might see through the game, you'll get to play a fruit machine. Prizes range from coins to an explosion which will propel you a bit further to a second chance to, well, nothing. And you know which of those you'll win most often. 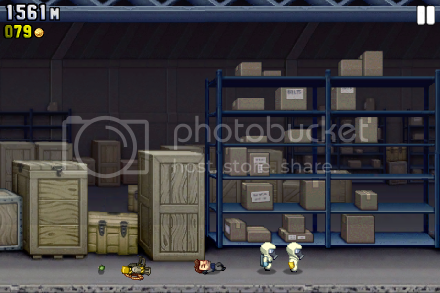 Jetpack Joyride is a very polished game, but that's only ever half the battle with a game. Most importantly, it's great fun, and it's nailed that crucial "just one more go" factor. It's a game that you'll keep on your phone or Touch, because you never know when you'll fancy another crack at it... you just know that you WILL fancy another crack at it. It's inevitable. Also, at the moment, the game is free. You know what to do.